First, a hat tip to the Washington Post for that bon mot. Last night, my husband and I ventured out to Nationals Park to see the much-hyped debut of the Nationals’ new 21-year-old ace, Stephen Strasburg (versus the Pittsburgh Pirates). He didn’t disappoint. Joe and I left our apartment near downtown D.C. around 5:00 for the 7:05 p.m. start, and the train was still packed by the time we got to Navy Yard. The excitement in the air inside the stadium was palpable, a feeling not at all fitting for a match-up between two sub-.500 teams. Even the elements conspired in Strasburg’s favor. It was absolutely perfect ballpark weather: 68 degrees, and not a cloud in the sky. Joe and I found our seats in the infield gallery, along the third baseline, in section 306. Among the sold-out crowd (pictured here in a photo taken by Joe on his iPhone), practically every other person wore a “37” red or white T-shirt. Ken Burns (“not local,” Joe informs me, after checking his iPhone) threw out the ceremonial first pitch, and then the crowd was on its feet as Strasburg calmly jogged to the mound. There were so many camera flashes during his first pitch that I’m amazed the umpire was able to make out the tiny white speck in their midst. But he apparently did, calling . . . a ball. But Strasburg doesn’t throw balls! After a rocky start (it took him eight pitches to throw two strikes), Strasburg got the first two batters to line out and ground out, respectively. And when he fanned Lastings Milledge (a former Nat) for his first strikeout of the game, the crowd erupted into pandemonium. Strasburg ended up striking out 14 over seven innings, including the last seven batters he faced. He walked none. By about the sixth inning, the crowd was again on its feet, cheering every pitch — and booing the home plate umpire when he dared to call a ball. And the Nats gave their new ace uncustomary run support. 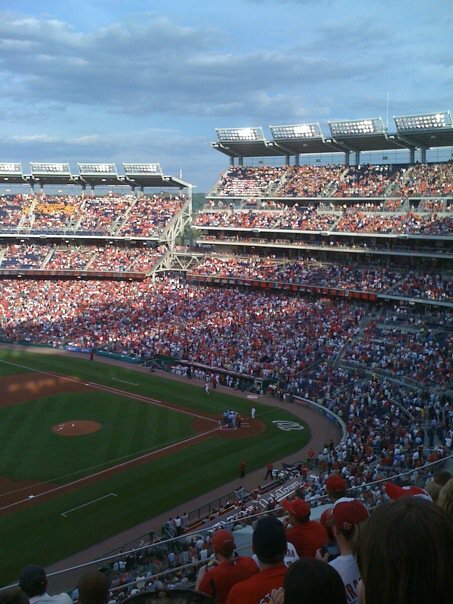 Ryan Zimmerman hit a solo homerun in the bottom of the first, reminiscent of his walk-off homer during the park’s inaugural game in March 2008, the last time I saw Nationals Park so packed. Adam Dunn hit a two-run shot in the sixth, which Josh Willingham immediately followed with a solo shot of his own. That turned out to be enough, but Zimmerman managed to score again in the eighth. Jesus of Nats-areth (h/t Steve Fox), indeed.